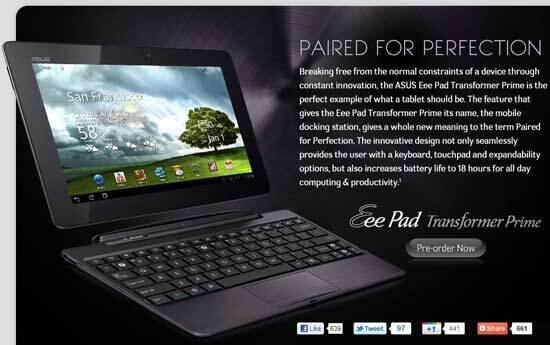 New Asus tablet, Transformer Prime is significant for everyone in the mobile industry. Because it’s the first mobile device in the history which is going to release worldwide. If you are a US or Canadian citizen then Asus will happily offer you to pre-order this Tegra 3 running tab on their website. 32GB quad-core Android tablet cost you only $499, where 64GB costs another $100 more. If you want a docking station for Transformer Prime then you have to pay $150 more. Though Asus still hides the US region release date of Transformer Prime but we guess it will be reality before mid-December. Now if you want to grab the 1st quad-core Android tablet in your hand then visit Asus official US tablet site and pre-order it.